I presented Wilderness First Aid and CPR/AED again last weekend - one more time this coming weekend and I'll be done until the fall. I've presented to over 100 people this year, so I'm ready for a break. To make the first aid scenarios a bit more fun, I've created fake wounds that are reusable. Putting moulage on a person looks cool, but has to be redone every time and gets messy. These wounds simply velcro on and off and still look pretty good. I also use these when scouts are doing their T-2-1 first aid advancment or the First Aid merit badge. I've noticed a much more focused effort from the scouts and better retention of the skill - besides they like to teach others because then they get to wear the wounds. It's really easy to make your own, and you might have this as a project for some artistic scouts. 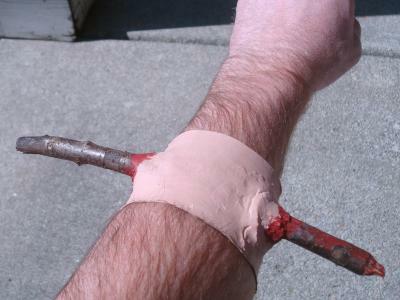 See Fake Wounds for examples, instructions, and printable images that you can just tape on for a super-simple solution.